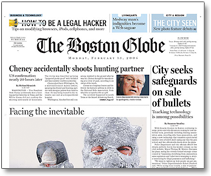 Order a printed copy of The Boston Globe that was published within the last 90 days. Quantities and supplies are limited. Order historical and contemporary photos taken by Globe staff photographers. There are a number of size and framing options from which to choose. Looking to reproduce content produced by Globe staff? Whether it is a story, photo, video or something else, find out how to request permission. World Series, Celtics championships: you can order any Boston Globe page published after 2001 to commemorate that special occasion or event.